HomeProfitable Locations If You are Looking for Business for Sale in Moe and Nearby Towns! There are plenty of location opportunities just awaiting your business with open arms. If you’ve been searching far and wide for the perfect site to start, have a look at this business for sale Moe. Located in between Trafalgar and Morwell, Moe is not only known for its dairying and electricity industries, but also for its historic touch that draws locals and tourists in—the perfect business opportunity! If there’s one place that never runs out of people, it’s this premier indoor sports centre. Stadium 34 is a popular facility in Moe that is not only a sports stadium, but also an inline skate and hockey rink. Pros, amateurs, and kids flock this sports centre every day for recreation, which makes it a great idea to place your business for sale Moe. After all, claw machines are always a good break time entertainment. Built in 1926, this rustic hotel has sheltered wary travellers and customers throughout the years, building a solid reputation and a loyal following over time. Propped in the main retail hub of Yarragon village, the Yarragon Hotel makes an efficient site for your claw machine business. Customers always find time to try their luck for a plush toy prize in such a cosy accommodation. Interested in business for sale in Yarragon, email us now! Trafalgar, which is just a few kilometres away from Darnum and Yarragon, is also a well-visited town in Victoria. The Trafalgar Golf Club, for instance, hosts a variety of events that draws a crowd every now and then. The golf club lobby would definitely look good with a claw machine in it. In a site where folks come and go, a claw machine would surely catch attention. If there is any place that instantly screams good foot traffic, it’s supermarkets—and Moe has a lot of them. 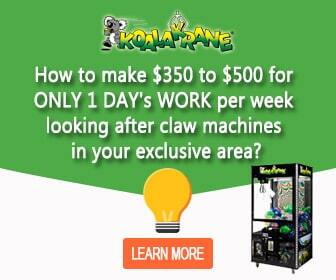 Prop your claw machine business opportunity Moe at your nearest Woolworths, Coles, IGA, or FoodWorks. It’s a foolproof site to place such a profitable entertainment machine. Watch your small business flourish by checking out these locations. Enquire about this claw machines franchise opportunity Moe today! See available claw machine franchise locations in Victoria: Echuca, Horsham, Mildura, Swan Hill, and Warrnambool.